“My love of pure functionality comes from my background, having been raised in a remote western area of Tasmania, Australia. After living in New York and Chicago, Laguna Beach California became their home. This is where Doreen’s passion for creating Ceramics began. 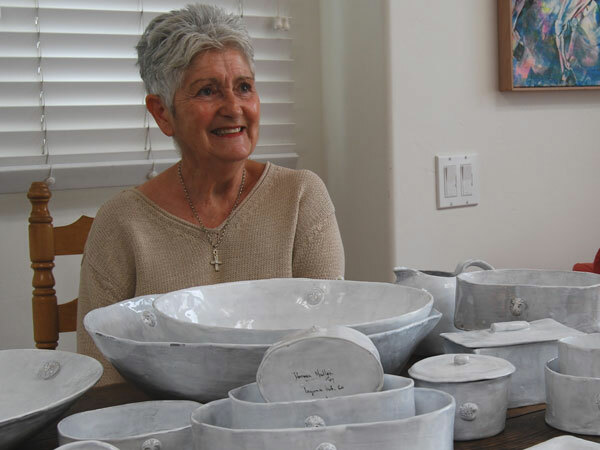 She opened the “Blue House Laguna” studio in January 2000, creating functional art to be used in everyday life, where each piece was produced to be unique and natural. “You just can’t compare these pieces with mass produced machine made ones….where every item is the same”. Each piece has a story, or inspiration from Doreen’s life and background. The Parisian Collection was the first,each piece has a hand drawn caricature, inspired by her time in Paris and Provence.This collection quickly became very popular due to it’s unique hand made qualities,designed for functional tableware use.Today she has some 5 individual Collections of Ceramic Tableware with Accessories to choose from. 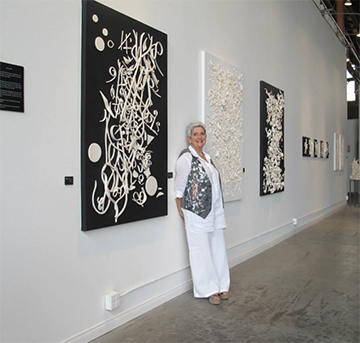 In 2012 “The Glashaus” in the heart of the emerging San Diego Art District of Barrio Logan,became the new exciting destination for the “Doreen Mellen Ceramic Art Studio” It is here she started creating her clay on canvas works,utilizing bits and pieces of vitrified clay as the mixed media on neutral black and white canvasses. Imaginative, dimensional works emphasize creative play and experiment in the evolution of unique wall art and sculpture. Shades of Clay – Concert Series – Performance,Intermission,Climax,Piano Concerto,Winter and Spring. Sculptures – Wizards of Rubbledom,The Stack and Fractured.